Mumbai: BARC ratings for week 12, has unveiled the performance of the newly launched shows of the Hindi Entertainment Channels in the respective week. The prominent new launches during the week 12 in HSM Markets includes, Kulfi Kumar Bajewala Bepanah, High Fever Dance Ka Naya Tevar, Ye Pyaar Nahi To Kya Hai to name a few. Out of these launches, Bepanah on Colors TV and Star Plus’s musical television series Kulfi Kumar Bajewala have performed well in the HSM Urban 15+ category. The romantic drama Bepanah featuring the famous actors Jennifer Winget & Harshad Chopda in the lead, whose launch episode lasted 45 mins on Colors on 19th March 2018 on its 9:00 PM (Mon-Fri) time band has performed extraordinarily well with opening day ratings of 2.5 average TVR with a reach of 5.5% and 21.9 mins of TS. The ratings of Bepanah in the opening week happens to be average 2.4 TVR with a reach of 5.1% and 18.7 mins of TS. On the other hand, Star Plus’s musical television series Kulfi Kumar Bajewala launched on 19th March 2018 aired in the weekdays in its 8:30PM time band has shown promising opening day ratings of 2.0 average TVR with a reach of 3.7% and TS of 15.9mins on its launch day. The drama has garnered opening day average TVR of 1.8 points, reach of 3.6 % and the TS of 14.7mins. &TV’s dance reality show, High Fever Dance Ka Naya Tevar launched on 17th March 2018 in its 9:30 PM Sat-Sun time band has witnessed an average TVR of 0.7 points and 2.7% reach with 20.4 mins of TS on the opening day. The opening week average TVR of the dance reality show happens to be 0.6 points with a reach of 2.3 % and 17.5mins of TS. Next in line, Sony Entertainment Television had also launched on 19th March 2018, a romantic drama, Yeh Pyaar Nahi Toh Kya Hai, telecasted in its 11:00 PM time band in the weekdays. On the opening day Yeh Pyaar Nahi Toh Kya Hai has managed to garner 0.5 points of average TVR with a reach of 1.4% and TS of 10.8 mins. Further the opening week average TVR happens to be 0.4 points with 1.4% reach and 8.3mins of TS. 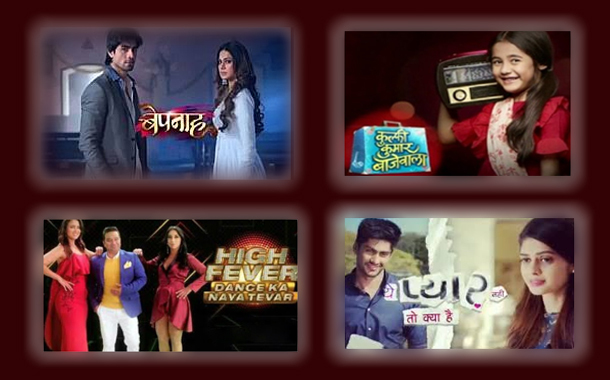 Taking the above data into consideration, it is observed that Colors and Star Plus have lined up equally challenging shows in its 8.00 PM to 10.00PM time band, though the former has taken a upper hand in the early phase, we will have to wait to know the performance of the shows in the upcoming weeks.